For other uses, see Classical Gas (disambiguation). 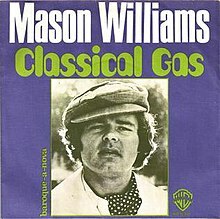 "Classical Gas" is an instrumental musical piece composed and originally performed by Mason Williams with instrumental backing by members of the Wrecking Crew. Originally released in 1968 on the album The Mason Williams Phonograph Record, it has been re-recorded and re-released numerous times since by Williams. One later version served as the title track of a 1987 album by Williams and the band Mannheim Steamroller. Originally named "Classical Gasoline", the song was envisioned to be "fuel" for the classical guitar repertoire. The title was later shortened by a music copyist. Williams was the head writer for The Smothers Brothers Comedy Hour at the time of the piece's release and premiered the composition on the show. Williams performed it several times over several episodes. After the piece had reached the Top Ten, Williams asked an experimental filmmaker named Dan McLaughlin to adjust a student video montage that he had created of classical art works using Beethoven's 5th Symphony and edit it in time to "Classical Gas", using the visual effect now known as kinestasis. The work, 3000 Years of Art, premiered in 1968 on an episode of the Smothers Brothers Comedy Hour. The song peaked at number 2 for two weeks in August that year. On the US Easy Listening chart, it went to number one for three weeks. It is sometimes erroneously thought that "Classical Gas" was performed, or even composed, by Eric Clapton. This may be due to the fact that Clapton was musical director of, and played much of the guitar music for, the feature film The Story of Us in which Williams' own solo-guitar re-recording of it, from his 1970 album Handmade, appeared. Clapton has actually never recorded the song. Williams re-recorded "Classical Gas" as a solo guitar piece on his 1970 album Handmade. This version was re-released by Sony in 2003, after being featured in the film Cheaper by the Dozen, which starred Williams's Smothers Brothers protégé, actor/comedian/musician Steve Martin. Midnight String Quartet covered the song on their 1968 album The Look of Love and Other Rhapsodies for Young Lovers. In Canada, this version was co-charted with the Mason Williams version and they reached #2 in the RPM Magazine charts. The Ventures recorded a cover for the album More Golden Greats, released in 1969. Under the name of "Synergy", Larry Fast recorded an electronic version for the album Sequencer in 1976. This version has served as the theme song for the WUSB (FM) radio program, Destinies-The Voice of Science Fiction since 1983. Zlatko Manojlović, Serbian guitarist, included the song on his 1995 album Zlatko. Vanessa-Mae recorded the song for her 1994 album The Violin Player. Tommy Emmanuel recorded the song with the Australian Philharmonic Orchestra on his 1996 album of the same name. Steve Howe recorded the song for his 1999 live album Pulling Strings. Les Fradkin recorded the song for his 2009 Ztar album Baroque Rocks. Glen Campbell also recorded and performed the instrumental regularly at his concerts. In the 1960s The Alan Copeland singers recorded a song that combined Classical Gas with Scarborough Fair. A college marching band plays the song at a basketball game in the 1971 film Drive, He Said. Argentine virtuoso guitarist Cacho Tirao (member of the Astor Piazzolla quintet) recorded the song along with Jorge Padín and Manolo Juárez for their 1980 album "Encuentro". Lisa Simpson on the animated series The Simpsons did a brief run-through of "Classical Gas". One of the showrunners, Al Jean, said he met composer Mason Williams, who told him how happy he was that they used it in the show. ^ a b Williams, Mason. "Writing "Classical Gas"". ClassicalGas.com. I envisioned it as simply repertoire or "fuel" for the classical guitar, so I called it Classical Gasoline. ^ "Classical Gas Original Video". ClassicalGas.com. 2013-04-08. Retrieved 2016-10-01. ^ Whitburn, Joel (2002). Top Adult Contemporary: 1961-2001. Record Research. p. 259. ^ "Classical Gas FAQ". ClassicalGas.com. 2013-04-08. Retrieved 2016-10-01. ^ Bianculli, David (2010). Dangerously Funny. Simon & Schuster. pp. 193–194. ISBN 978-1-4391-0117-9. ^ "Item Display - RPM - Library and Archives Canada". Collectionscanada.gc.ca. 1968-08-19. Retrieved 2019-03-08. ^ "The Irish Charts – Search Results – Classical Gas". Irish Singles Chart. Retrieved March 18, 2019. ^ "Official Charts Company". Officialcharts.com. 1968-09-03. Retrieved 2019-03-08. ^ "Official Charts Company". Officialcharts.com. 1995-11-18. Retrieved 2019-03-18. ^ "The RPM 100" (PDF). Collectionscanada.gc.ca. Retrieved 2016-10-01. ^ "The Ventures – More Golden Greats". Discogs. ^ "Synergy (3) - Sequencer (Vinyl, LP, Album)". Discogs.com. Retrieved 2016-10-01. ^ "Zlatko - To One Woman (CD, Album)". Discogs.com. Retrieved 2016-10-01. ^ Turner, Chris (2004). Planet Simpson. London: Ebury. p. 75. ISBN 0091897564. ^ Welk, Brian. "'The Simpsons' Oral History of 'Last Exit to Springfield,' The Best Episode Ever". TheWrap. The Wrap News Inc. Retrieved 25 May 2018. This page was last edited on 30 March 2019, at 12:21 (UTC).